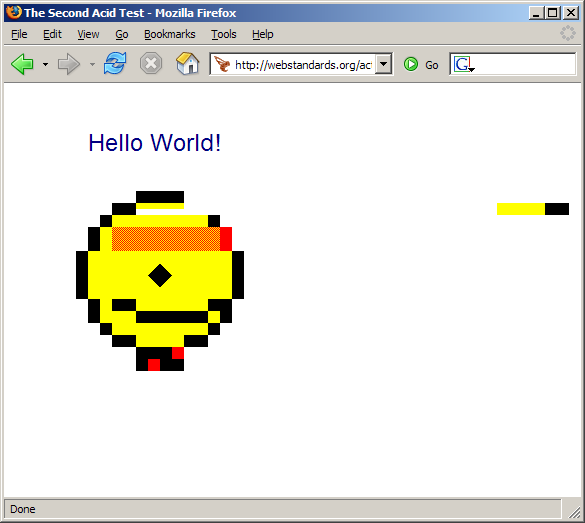 It looks like Firefox 1.1 could get pretty solid support for SVG. This is good news, since there are some pretty cool things you can do with SVG. Opera 8 already has support for SVG Tiny, but as I understand it, the support that has been checked into Firefox goes far beyond that. I may be wrong though, since I haven’t studied this very thoroughly. 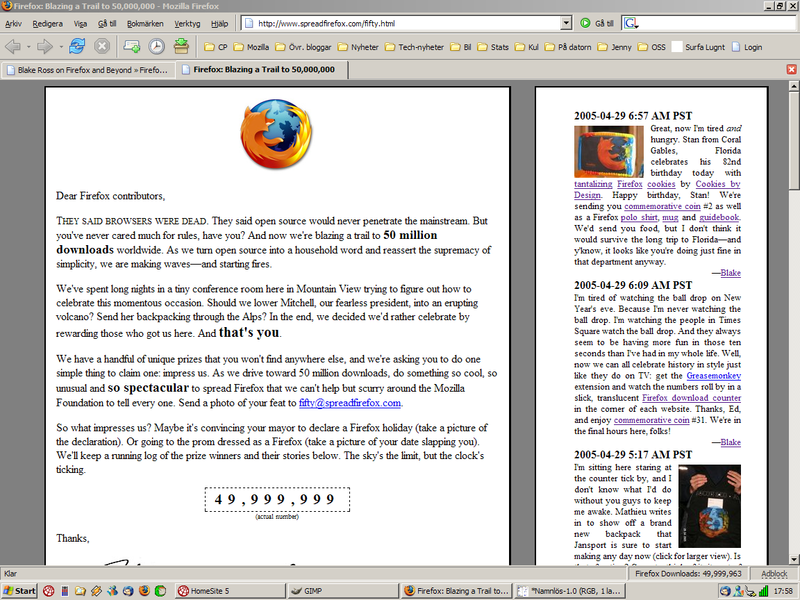 Posted in Mozilla Firefox | Comments Off on SVG in Firefox 1.1? 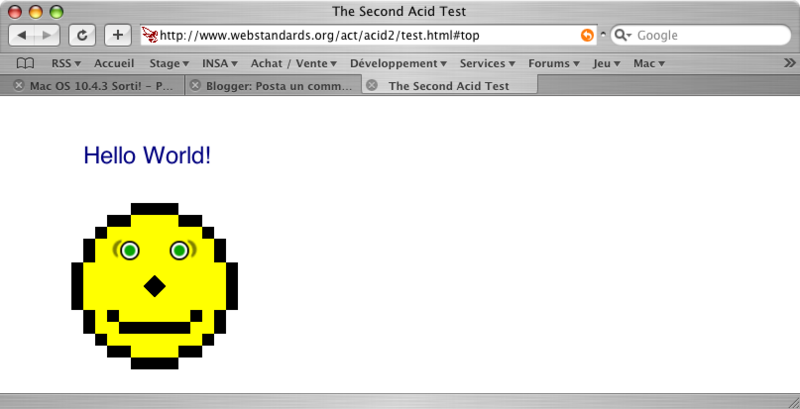 David Hyatt has now fixed all the bugs in Safari which kept it from displaying the Acid2 test correctly. Now it just remains to be seen who does the first release which correctly renders the test. T’would surprise me though if it weren’t Apple. Macromedia + Adobe = ? MacDobe? (Would probably get them sued.) Adromedia? (Sounds like a galaxy.) AdMedia? (May send out unwanted signals.) Macrodobe perhaps? Any more suggestions? Posted in Uncategorized | Comments Off on Macromedia + Adobe = ? Safari to Win the Acid2 Race? It’s looking more and more likely that Safari will be the winner of the race towards correct rendering of the Acid2 test. David Hyatt’s latest blog post shows that he only has about two errors/bugs left to fix before Safari crosses the finishing line. Although, it will still have to be made a public release to win in my eyes. 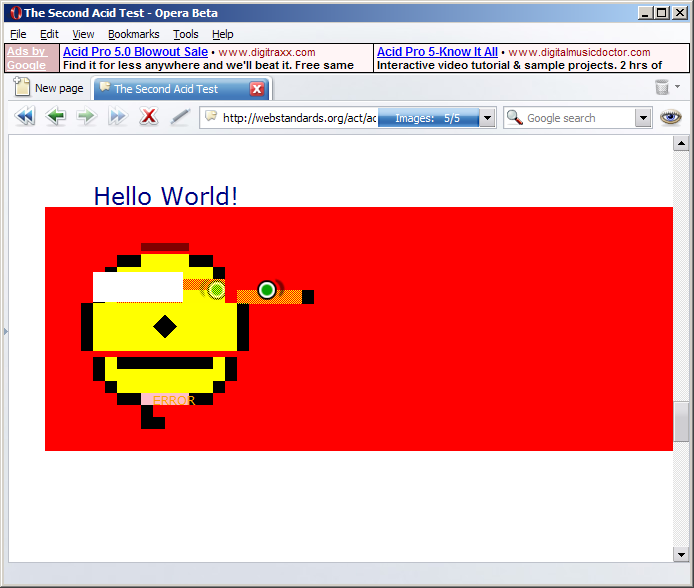 Posted in browsers | Comments Off on Safari to Win the Acid2 Race? David Hyatt is making some speedy progress on fixing Acid2 rendering in Safari. He’s already worked out two of the bugs visible when using v1.2. Safari 1.2 and 1.3 screenshots are available at The SeBlog. Some of you may already have noticed that comments which were posted here during the slashdotting today (and all previous comments too) have disappeared. That’s because I had installed the Haloscan comments and trackback system, and I uninstalled it today when I was re-doing the appearance of this blog. Apparently the system isn’t smart enough to save the comments. I know the new look is a little boring and square, but it will do for now. I may get round to improving it a bit more later on. Found this enjoyable blog which collects links to Google Maps showing things worth seeing in the US. Update: Corrected the title, replacing the World with the US . 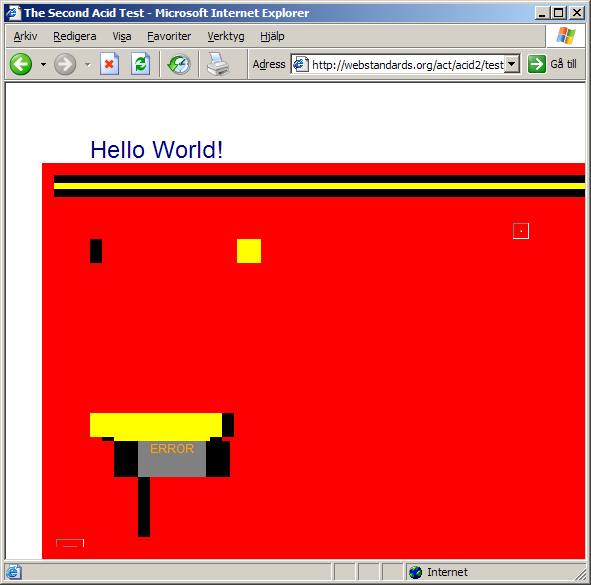 About a month back, Håkon Lie announced the planned creation of a browser technology test page named Acid2. 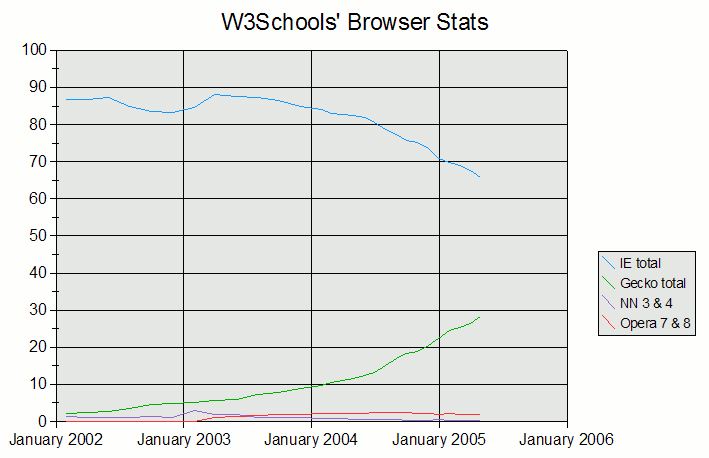 The Web Standards Project agreed to sponsor and host the effort. 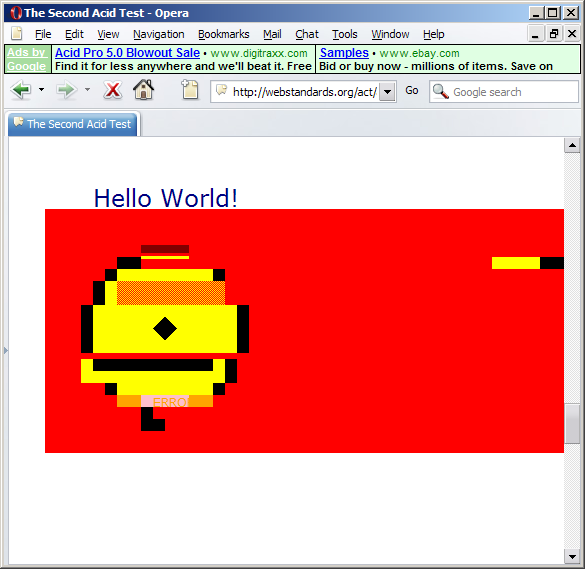 Now the Acid2 test has been launched, although it hasn’t yet been officially announced. It’s quite an ingenious work of art actually. It consists of a complex HTML page which makes use of a whole number of advanced CSS2 features. 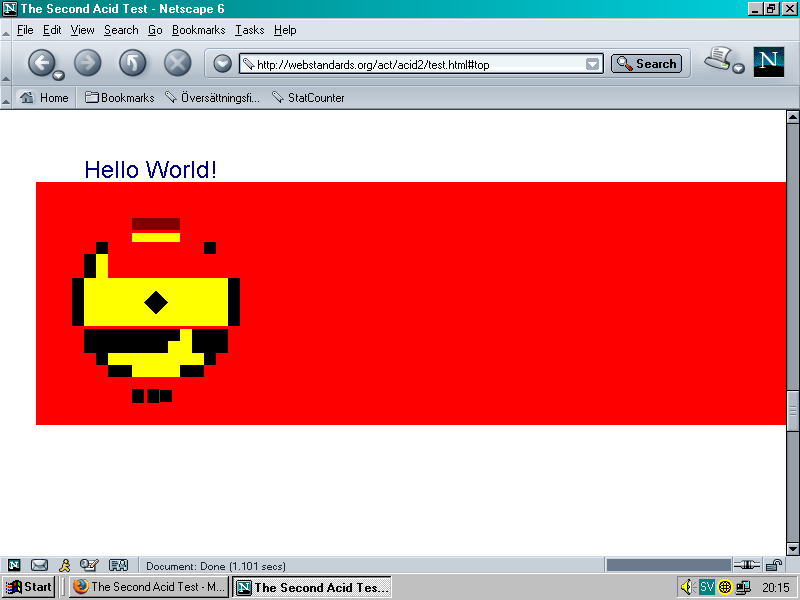 If rendered correctly, the various divs and spans and what-nots will make up a happy yellow face. 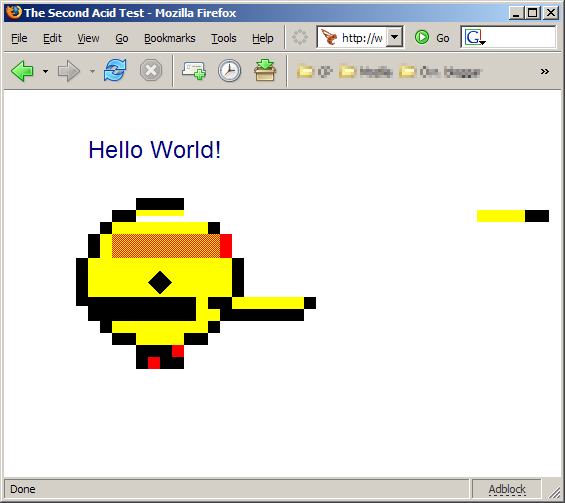 Hopefully the Acid2 will inspire all the browser makers to further improve their standards compatibility. He who lives shall see. Update: Reduced the size of the screenshots a bit. Update 2005-11-02: Safari now passes the test! HamsterDeCombast posted a screenshot in the comments.